I am lucky enough to say that I’ve been to every Wells Fargo Championship in Charlotte since the very first year. I’ve done it with and without kids, from toddlers to teens. One thing is certain, from an early age, the kids are in it for the signatures. 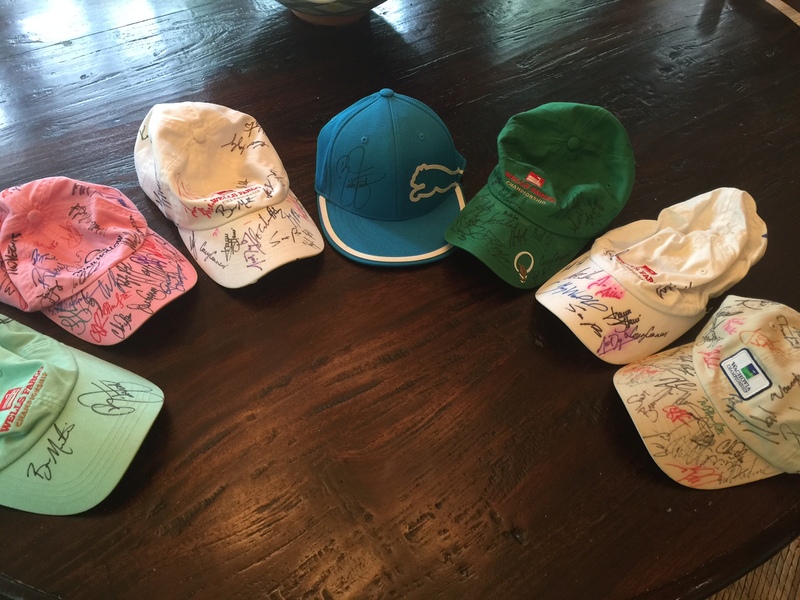 They want their hats signed by the best of the best, whether it’s the latest and greatest on the PGA TOUR or it’s the coolest local celeb in the Pro-Am. They want it all, on their hats that they can wear all year long. I’m here to give you some Smarty tips on what I’ve learned over the years, sometimes the hard way. I personally love taking my kids because there is nothing sweeter than to watch their eyes light up when their favorite player gives them a fist bump, or even better, a signature. 1) Ticket Policy for Children: Children 12 and under are admitted free when accompanied by an adult ticket holder (one child per adult). The latter of this sentence tends to be looser on the Pro-Am days and practice rounds. But as long as you’re not dragging in a screaming monster, some nice adult in line will let you take an extra kid on their ticket. This comes in handy when you’ve got a few extra kids in your posse. The tour wants families to enjoy this tournament, so use this as an opportunity to teach your children golf etiquette and how to be quiet when they need to. 2) Best Day(s) to get signatures: The Pro-Am and Practice Round are your best bet. The Practice Round (Tuesday) is officially the day that most golfers really pay attention to the kids following them. Check the pairings and tee times the night before you plan on going and map out your day in advance. Also make sure you download the WFC pairings app here: wfcpairings.com. The Pro-Am days are fun to get some local pro athletes in the mix – rumor has it there is going to be an amazing pairing on Wed with two of the most popular Carolina Panthers. This is just a rumor, but enough to convince the Plym twins that they must play hookie on this day:-) Hopefully their teachers are not reading this. 3) Bring a Sharpie for each kid: This is an easy one to forget. Mine like to bring different colors and share. 4) Youth View: A designated fenced in area located near the Driving Range allows children 12 and under to view PGA TOUR players warm up prior to tee off and practice after their rounds are completed. Parents will not be allowed in this area. SMARTY ALERT: This is where my boys got their most coveted signature to date. It was the year of Rickie Fowler and they had just purchased the Puma flat hat. As soon as they strolled out of the merch tent, they walked on up to the Youth View section, and there he was. It was serendipity. They won’t ever put another signature on that hat! 5) Stroller/Diaper Bag Policy: In WFC words – Children 12 and under are admitted free to the tournament when accompanied by a ticket holding adult. Please make sure to walk away from play if your child gets fussy as to not to disturb the golfers. We encourage parents with young children to bring umbrella strollers since they are easier to maneuver around the course. Diaper bags (including bottles, juice or snacks) are permitted but will be checked at security points for weapons and unauthorized objects. 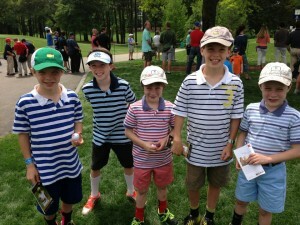 6) Safe-Tee Kid Program: Patrons can pickup these brightly colored wristbands labeled “Wells Fargo Championship-Safe-Tee Kid” at the Information/Guest Services tent located at the main entrance near the bus shuttle. Each wristband serves as a friendly reminder for children to contact a tournament ambassador should they be separated from their parents. Ambassadors will be dressed in tournament uniform and have an official credential. You definitely want to do this if you have a known wanderer in your mix. Or twins. 7) When do you let tweens walk around by themselves? In our household, it’s middle school and they must have designated check-in times and locations. It’s not uncommon to see a cute posse of middle schoolers dressed in Lilly, Vineyard Vines and Jack Rogers cruising around the tourney. Just remind them to keep quiet and pay attention to the golfers. They tend to be louder in packs. 8) Wear Comfy Shoes. Unless you have a high-roller spouse or friend and you have full access to the Green Mile and Clubhouse, you’re going to be walking. A TON. And it has been raining for 3 days. This is not the time to whip out your high fashion wedges, especially if you have babes in tow. Be sensible and normal, you’ll thank me for that later. I think the hipster New Balance collection or Vince Camuto slip-ons are perfect for the WFC. Goes with any cute shorts outfit you have. Or even better, borrow your teen’s Adidas Superstars. She’ll never know. 9) Bring a small cinch backpack: Not your fab Louis Vutton mom bag – the rule for bags is 6″x 6″. This is the time to be practical. You’re going to want to load that up with sunscreen, sharpies, and possibly small rain covers. Be smart(y), not sorry. 10) Check out Charlotte Agenda’s Insider’s Guide to the WFC. In typical millennial fashion, they have every beer stand and food venue mapped out for you to enjoy your WFC visit to the fullest. Sometimes I really wish I was a millennial. They eat and drink their way through every event in town, all while I’m stuck in carpool traffic – uber for parents, why aren’t you here yet?! Remember, this is the last WFC here in the QC, next year it’s moving to Wilmington. But don’t be too bummed, Quail Hollow Club will be hosting the 2017 PGA Championship August 17-20, 2017. Lather, rinse, repeat. Have fun, y’all, and we’ll see you on the course this week! Who wants 3 FREE classes at Flywheel??? Playmobil -Toys for the Crazy in Us? It’s only moving to Eagle Point in Wilmington for one year since the PGA Championship is in Charlotte next year. After 2017, it’ll be back. Another tip — Kids get whatever access the parents’ tickets are (except the hospitality suites). So on Saturday when we go as a family, my husband and I usually splurge for clubhouse tickets (or Event Lawn) for a little AC break and “real” bathrooms for our two girls. This tournament is one of my family’s fave traditions — so well done every year!